Ballet Squid Chronicles: Wardrobe Malfunction! In the middle of barre I noticed A Draft. In horror, I did a quick, “Ohai, just rearranging my shirt!” and discovered that little hole had conveniently opened in the back seam of my ersatz tights (which are really leggings, which is unimportant). It was not in The Worst Possible Place – I was able to arrange my tights pro-dance-guy-on-stage stylie (yes, in case you’re wondering, the in/famous Male Ballet Wedgie is very much intentional). Thus, I more or less made it through class, occasionally making nice lines when I could forget that at any moment I might burst a seam and horrify the girl behind me or PDG* or our teacher (regardless of what my husband may believe, most people probably do not want to see my nekkid behind). I say “more or less” because my head was not in the game and Tawnee likes to give us long, complicated combos at the barre. So basically I spent the whole class approximating with half my brain while the other half worried about my backside. Worse, because the demiurge of ballet has a twisted sense of humor, Tawnee decided today was a good day for a barre stretch. One with lots of bending over and pivoting and so forth. In the studio with the Really High Barre. Needless to say, I approached that exercise with trepidation. Fortunately, the impending Wardrobe Disaster did not arrive. I fumbled my way through basically everything else. I seem to have a mental block regarding doing anything right, ever, in Tawnee’s class. 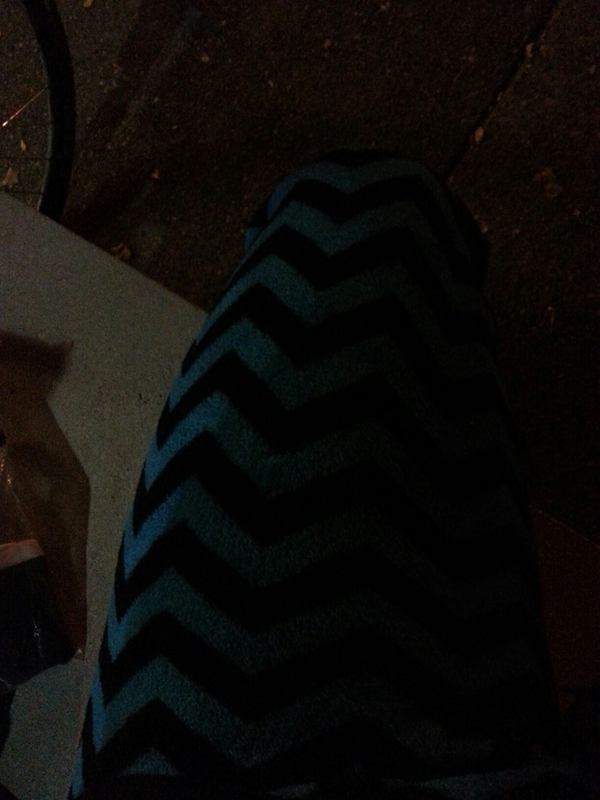 These pants scream either "I'm crazy" or "I'm a dancer and I don't care" or maybe both. Hell, probably both. I had been thinking of buying some warm – uppish pants anyway, because winter, y’all. So now I have fuzzy warm – up pants and a way to get home without blinding anyone (though, come to think of it, if my tail-light dies, there are few surfaces as blazingly pale as those parts of me that never see the sun, and my behind could probably double as a reflector). My leg muscles are really happy to be wearing these, oddly enough, so there’s a nice silver lining. So that’s it for Wednesday class. On Monday, I was Coming Together; today, I was Coming Apart. *Who was totally in class tonight and upon whom I totally have a kind of Ballet Crush. Someone please tell me I am not the only proto-dancer who develops Ballet Crushes? Posted on 2014/10/01, in Uncategorized. Bookmark the permalink. 4 Comments. We were totally discussing the in/famous intentional male dancer wedgie in morning class today, lol! And bonus points for using the word “demiurge”. A million likes for you!